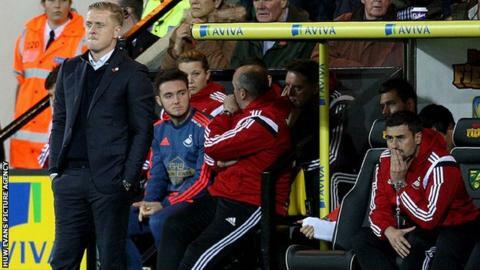 Manager Gary Monk says Swansea City have to fight their way out of their current poor run of form. The Swans lost 1-0 at Norwich City on Saturday and have won only once in the Premier League since August. The defeat saw them drop to 14th - five points above the relegation zone. "We have to stick together, we can't just point fingers or cause anger or anything like that, we have to stick together and we have to work through it," said Monk. "The players are more than capable of doing that. It's just a question of getting back to where we were. "We had the right game plan but we just didn't execute it." Swansea dominated possession against the Canaries, but were caught out in the 70th minute when Jonny Howson headed in from short range following a corner. Monk said it was a momentary lapse, and typical of their recent form. "One lapse of concentration has cost us the game and that's frustrating," added Monk. "At this moment those lapses are costing us dearly. In these situations, we are the only ones who can get ourselves out of it." Last season - his first full term in charge - Monk guided Swansea to eighth in the Premier League and a record points total of 56. Swansea made a good start this season, drawing with Chelsea at Stamford Bridge on the opening day and beating Manchester United 2-1 at the Liberty Stadium. But since August their winning ways have largely deserted them, though Monk has experienced tough situations in the past - particularly after succeeding Michael Laudrup as manager in February 2014. "And I've experienced them as a player as well. "What we do at those points is stick together as a club. "That's what Swansea's been built on. We stick together, we fight hard and we come back and show our quality, and that's what these players have to do and I'm sure they will."